Rubber roofs are a popular choice for both flat and pitched roofs throughout the country. Rubber is a relatively lightweight roofing product that is available both in rolls for flat roofs and tiles for pitched roofs that can even mimic other types of roofing materials. Rubber roofs are one of the main types of flat roofing materials. Called EPDM rubber roofing, the rubber is a rolled membrane that can be applied in a number of different ways. Known as ethylene propylene diene monomer, rubber roofs can come in rolls as much as 50 feet wide and 200 feet long. The rubber can be ballasted to the roof. The membrane is laid out and stones are laid out on top of the membrane to keep it in place. There is a mechanism that can be used with the rolls to attach the roof in place and, finally, there is an adhesive-based system. Low or no-slope buildings covered with rubber roofs are highly resistant to wind, hail and low temperatures. In addition, light-colored EPDM offers UV protection by reflecting the sun’s rays off the surface of the roof. Rubber shingles are becoming increasingly more popular because they are lightweight, can be manufactured in a variety of colors and can be made to mimic other roofing types. 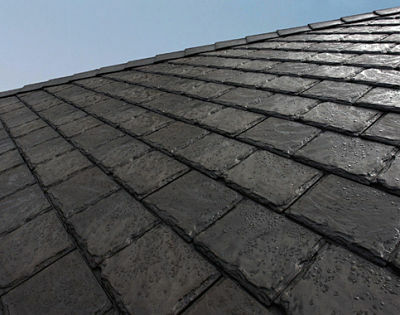 One popular brand of rubber shingles is a type that resembles slate tiles. Rubber roofs are extremely weather resistant and can come in light colors to add reflective properties to help create a cool roof. One of the biggest advantages of rubber roofs is the simplicity of making minor repairs. Spare pieces of rubber shingles can be used to replace damaged areas. Repairs can also be made with a liquid rubber product that seals as it dries to repair any splits or cracks in rubber shingles. Rubber roofing is not nearly as inexpensive as asphalt – both for peaked and flat roofs. Rubber shingles are moderately expensive – a little more costly than wood roofs but not as expensive as slate tiles. However, they are extremely long-lasting and require little maintenance. Roofing experts argue that the lifetime cost of a rubber roof makes it competitive with any other type of roofing now being sold, if you consider maintenance costs and the number of times other roofing products may have to be applied and reapplied over a 50- to 75-year period.